I’ve always been a goal oriented career person. But, I’ve always been in the public sector. Della has been in front end customer service. Now that we’ve started our own health and wellness franchises we’ve had a lot to learn. We experienced a lot of disappointment until we picked up on a couple lessons. The first lesson was learned listening to the audio book Go for the No by Andrea Waltz and Richard Fenton. An easy listen with the message, don’t set goals based on hearing Yes, set goals based on hearing No. My example is I used to set a goal of making 3 calls a day. They could be phone calls, emails, text messages, what ever you get the idea until I got 3 people to say Yes to my offer. Since my goal was to hear Yes, I experienced disappointment when I heard No. So much so, I often could not make that next call even though I’d not reached my daily goal. Go for the No taught me to set a higher goal of 20 calls where I heard No daily. 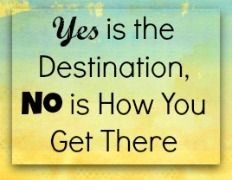 Along the way, you hear Yes much more often. Regularly even more than the previous goal of 3 Yes’s per day. Now instead of disappointment when I hear No, it’s almost elation. We’ve heard from many coaches that we should not be involved in the outcome. It was not until I heard Go for the No that I’ve been successful in making that separation. That’s the second lesson we’ve picked up. 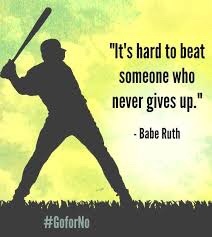 Fenton and Waltz have teamed with Ray Higdon to develop a sequel called Go for No for Network Marketers. We like the audio book format so that whether in the car or at home we can listen. It’s one thing to understand a concept, it’s another to put it into practice. You have to get out and talk to people and hear no many, many times until the lesson is understood and applied. This is not my chart. I found it on the Internet. When I read it I readily agreed with most of these. 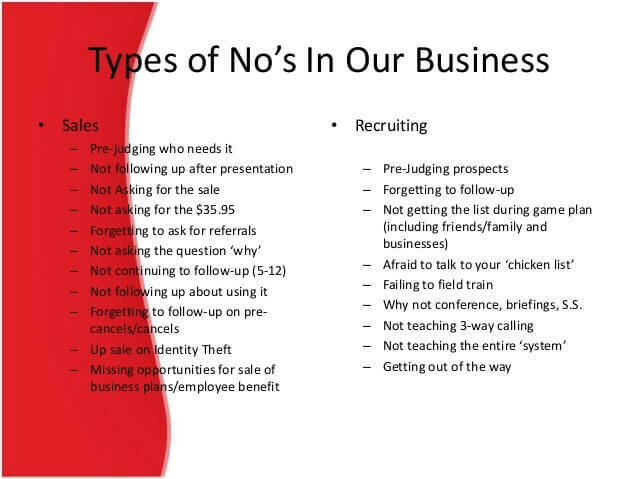 They are certainly ways to fail at marketing and recruiting. The third lesson we’ve picked up is don’t prejudge people. It’s not your business to decide if a person can afford or is ready to hear you message. Tell your story, let them decide. I don’t know who succeeded brilliantly the first time out. 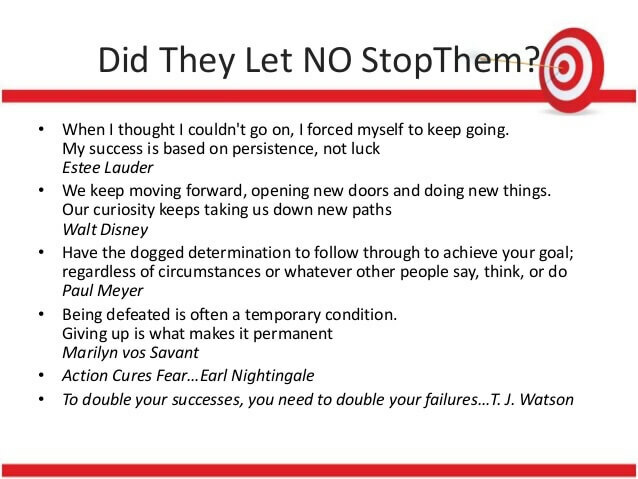 Here’s some quotes from those who did not give up.